A tribute to the dental profession. 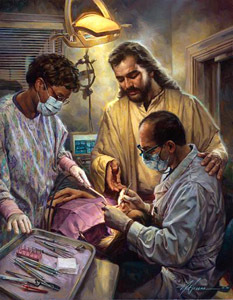 In Good Hands, originally commissioned by a dentist as a statement of faith, reflects the precision and care in this specialized aspect of medical ministry. In Good Hands copyright© 2005 by Nathan Greene is prohibited from being copied. Web pages copyright© 1998-2013 by Christ-Centered Art. All Rights Reserved. Nathan Greene art, dentist, inspirational paintings, medical, dental, art work, canvases, images, paintings, pictures, and prints of In Good Hands by artist Nathan Greene for sale. In Good Hands painting by Seventh Day Adventist artist Nathan Greene can be purchased in art print or canvas form at special sale prices at Christ-Centered Art.